Transitioning from a school psychology graduate student to a practicing school psychologist involves rapidly acquiring a diverse skill set and using outside-the-box thinking to handle a variety of new situations. NASP recognizes that offering additional supports can be helpful during this period of change and growth, and we have developed a variety of resources with early career school psychologists in mind. NASP offers school psychology professionals in the first two years of their career discounted membership rates and discounted registration for the Summer Conferences. We offer special early career programming at our annual conventions, and invite you to participate in the Convention Mentoring Program. Early career members also have a special online Community where they can interact, support each other, and ask for advice, and they are represented by the Early Career Committee within NASP leadership. As you transition to your school psychology practice, NASP has resources relating to identifying and working within team at your school, tips for making it through your first year, and a handout on professional ethics, including considerations for early career professionals and recommendations for developing an ethical practice. Checking in with yourself, communicating effectively, and creating a manageable sense of work-life balance are all vital as you begin practicing. NASP has resources to help you use self-reflection and engage in conversation about communication styles within teams, proactive tips for using communication effectively for success, and developing professional relationships and reducing stress. Supervision is an incredibly important topic for school psychologists who are new to practice. In advocating for supervision that is consistent with best practices, you can use the hierarchy of NASP-approved school psychological supervision. You can also view the results and analysis of a survey about supervision in the early career, and a presentation on forming a peer supervision group. It's never too early to begin thinking about how to advance your career! We offer a fact sheet on the difference between resumes and vitas, how to organize your vita, and sample vitas, plus information for prospective faculty members. Additionally, the NASP Career Center is a great place to begin your job hunt, and select Career Center jobs are visible to members-only for the first 7 days. As a school psychologist, there are career paths beyond school-based practice that are available to you. These paths include serving as a faculty member or administrator, working in private practice or as a school neuropsychologist, and more. 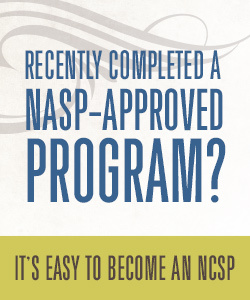 NASP has fact sheets that discuss these options, explain the challenges and rewards of being an early career academic and help you determine if an academic position could be a good fit for you, and provide insight into the training needed for a career in academia and the domains of responsibility for faculty members. School psychology professionals in their first and second years of practice can save on NASP fees! You can also use the Leave of Absence membership to help you stay engaged if you work part-time, take a break from practice to care for children or relatives, are currently searching for a job. Taking on a leadership role is an effective way to bring about systemic change. We have resources that define leadership and the importance of advocacy during the early career years, and describe some of the ways and levels at which they occur. Additionally, the Advocacy Action Center is a great way to get started with your advocacy in a way that's fast, clear, and easy!